Our Rock Dog movie review was written by guest blogger, Robin Elton. When my kids were young, my favorite show to have to watch with them was Kipper, based on the books by Mick Inkpen (one of the best names for an author/illustrator ever, IMO). Kipper the Dog was a very laid back beagle with a soothing voice who, along with his rapscallion Scottish terrier friend Tiger, was always having really epic adventures peppered with adorably British details (my kids called flashlights “torches” for years). There was a certain level of wide eyed exuberance and enthusiasm to Kipper, a matter of fact acceptance of the remarkable, a sense of wonder-full things around every corner. After attending a press screening of the Rock Dog movie, a Chinese animation film based on a comic book series penned by actual Chinese rock star Zheng Jun, it took me a few days to put my finger on just what I loved so much about it. Eventually, I came up with this: it embodies the same childlike and awe-filled spirit as Kipper, and applies the same sort of soothing balm to the spirit. Click on this to BUY your Rock Dog Movie tickets BEFORE you go to the theater from Fandango with our link. Rock Dog follows the story of Tibetan mastiff Bodi (voiced by Luke Wilson, my favorite Wilson brother). When he was a child, growing up in a mountain utopia with his father, a population of music loving but not-so-smart sheep, and a sage named Fleetwood Yak, the village was beset by wolves. The attackers were driven off by the elder mastiff, who as a result is obsessed with fending off future wolf threats: locking up all the musical instruments as a dangerous distraction, attempting to train a team of watchsheep to be better at vigilance than wool gathering, and preparing present day Bodi to one day take his place as protector of the flock. While funny, the Rock Dog movie admittedly isn’t on the same level as so many of the slick, quick witted kids’ movies we’ve seen lately. The sarcasm factor is low; there’s no attempt at razor sharp humor or precocious protagonists. That appears to be intentional, as its writer has been quoted as saying he was looking to produce an animated film that promoted the “good values in oriental and Chinese culture.” Since animation is considered to be more for kids only in China, there’s less effort spent on the sophisticated, generation-bridging sight gags and dialogue that we’re accustomed to. I feel like some kids might find it boring in parts, as my young nieces now find Kipper boring. 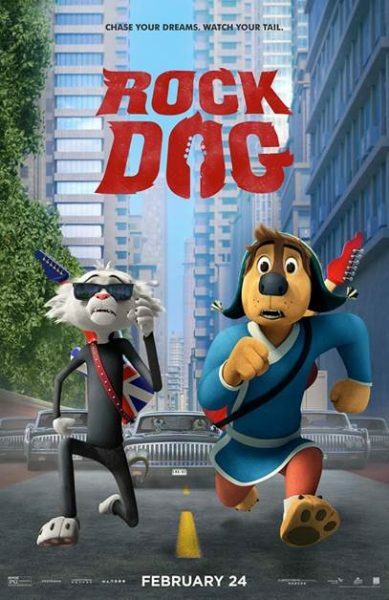 For me the most disappointing factor was that for a movie about a dog embarking on a journey to become a ROCK DOG, there’s no standout songs to rock out to— you’d hope a movie with that title would have a killer soundtrack. No, the Rock Dog movie culminates in a song that’s more of a ballad: it’s soft rock at best, but also soft rock at its best. I was moved by it. My daughter, a budding musician herself, was thrilled by it and fascinated by the song-writing and production process. The Rock Dog movie could have rocked harder, to be sure, but it’s still a wonderfully sweet, feel-good movie that’s lovely for its understated animation and gentle simplicity. There aren’t a lot of memorable moments, but in the moment it’s highly enjoyable. Bodi remains irrepressible and sincere against all odds in the pursuit of his dream, while upholding his responsibilities to his village and his family. Lessons are learned. Laughter is had. Songs are sung. We are reminded that anything is possible, that sometimes our dreams are our destiny, that the ordinary can be extraordinary. And ultimately, as the music swells, spirits soar. That’s what music is for, right?